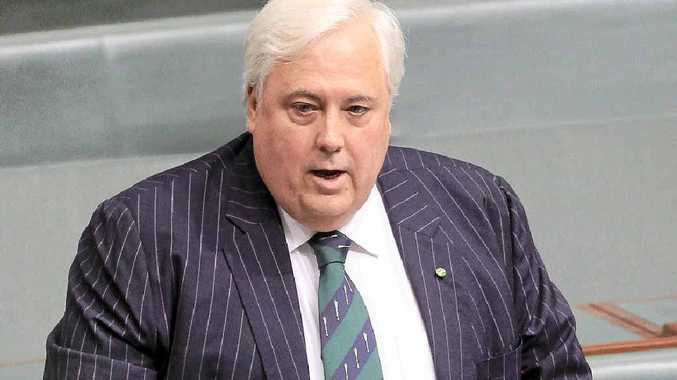 CLIVE Palmer is daring Prime Minister Tony Abbott to take his tough budget back to the people in a double dissolution election, tweeting this morning that his Palmer United Party would run candidates in all lower house seats, with Mr Palmer himself running for the top job. Mr Palmer tweeted: "If @TonyAbbottMHR wants to call a double dissolution election @PalmerUtdParty will stand in all lower house seats & I'll run for PM #AUSPOL". It is the last thing the government needs after handing down its no-pain, no-gain budget on Tuesday night. Opposition Leader Bill Shorten warned overnight in his budget reply speech that Labor's resolve would not shrink if faced with another election. Mr Shorten accused the government of ambushing and betraying the Australian people who now "feel shocked and angry" at the detail of cuts in Treasurer Joe Hockey's first budget. "This is just the beginning, turning Australia into a place most of us won't recognise - colder, meaner, narrower," he said. "This is a budget that would seek to demolish the pillars of Australian society - universal Medicare, education for all, a fair pension, full employment." The Treasurer later rejected Labor's budget fight, saying the Opposition was in denial over the true state of the economy and the work needing to be done. Mr Shorten revealed Labor will oppose around $13 billion worth of cuts and tax hikes, including the changes to university funding and student support. Cuts to pensions and family benefits, the $2.3 billion fuel excise increases, delays on Newstart payments and the $7 GP fee are all on Labor's no list. Mr Palmer took to the airwaves yesterday to make a plea for government that had a focus beyond money. The mining and tourism magnate turned MP took aim at the politicians, saying many failed to look at things honestly and lied to people. Speaking on the ABC's AM program, the Fairfax MP said Australia's debt was the third lowest in the OECD and it remained one of only 13 countries that retained a Triple A credit rating. "I think all the other countries of the world would be envious of that position," he said. Yesterday, Mr Palmer said none of the government's claims of a debt crisis washed as excuses for people who had paid their taxes over 50 years to find themselves abandoned by the government in the twilight of their life. "We must stand for more than money," the multi-millionaire said. "You know the gross domestic product measures a lot of things. It measures the cost of ambulances that take the carnage from our road, the cost of our prisons, our armies, the cost of our courts, the cost of locks to lock people up. "But it doesn't measure the smile on a child's face in the morning, the integrity of marriage, the incorruptibility of our public officials. It doesn't measure any of the things that make life worth living. "So our country, our Commonwealth is much more than an economic formula. It's people." Rejecting the government's push to shift the retirement age to 70 he said parliamentary superannuation eligibility should be linked to the pension age.